INTI’s pedigree of nurturing top students has been proven yet again as five of its students were selected to receive full scholarships at the University of New South Wales (UNSW) through the Golden Jubilee scholarship program. The students, from diverse fields of study ranging from Business, Science and Engineering to Information Technology, attended the annual presentation ceremony hosted by Emeritus Professor Mark Wainwright, Patron of the Golden Jubilee Scholarships at UNSW. Since its inception in 1999, the Golden Jubilee scholarship has been awarded to 39 INTI students who received approximately AUD823,930 (RM2,677,772.50) in total. 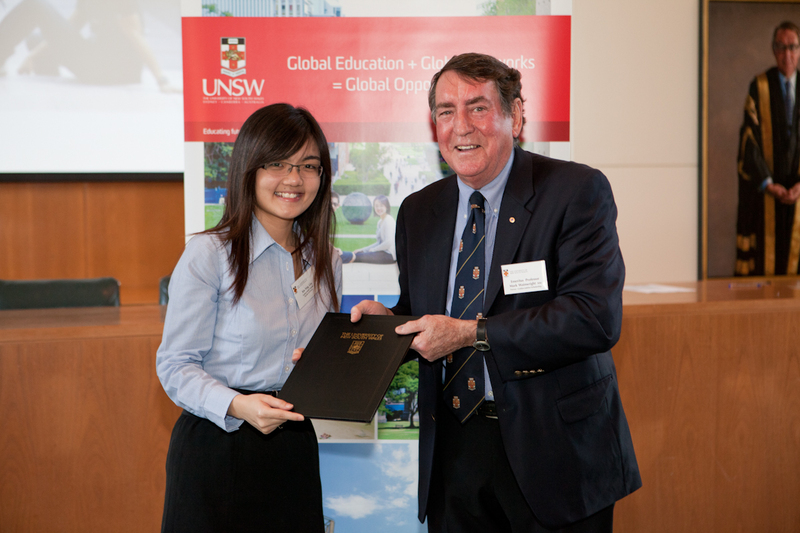 Lim Xin Ying (left) was one of the five INTI students who received her scholarship award from Emeritus Professor Mark Wainwright. “The lecturers at INTI International University (INTI IU) shared a lot of knowledge that I could never obtain from textbooks. They often gave useful advice, and taught us how to achieve success in all that we do. INTI IU also provides a good environment which is conducive to studies,” said Kang Chun Pin, a Golden Jubilee scholarship recipient from the university. Another scholarship recipient, Lim Xin Ying, felt that her experience at INTI enabled her to adapt to life in Australia easily. “My lecturers provided a lot of guidance to prepare me for studies overseas. The courses at INTI are also closely related to what we study at UNSW, so I was never lost or left behind in my studies at UNSW,” she said. The UNSW Golden Jubilee Scholarship covers two years of tuition fees and there are 40 scholarships available per year. Outstanding international students are chosen from five selected polytechnics in Singapore and seven colleges and universities in Malaysia. Aside from numerous foreign and local scholarships, financial aid is available to students at INTI. INTI Edu-Assist is a new scheme for new applications for Foundation studies for the January and February 2012 intakes. It offers a partial grant on tuition fees to PTPTN loan recipients and applicants of Foundation programmes with the objective of minimizing the out-of-pocket tuition fees that students are required to cover. Students benefit not only from INTI’s 25 years of experience and strong track-record, but also gain from the global synergy and resources that Laureate International Universities provides. INTI is part of Laureate International Universities, the world’s largest private education network with a presence in 29 countries, with more than 60 accredited campus-based and online universities and 130 campuses, serving over 675,000 students globally. For more information on INTI’s programmes, scholarships and Edu- Assist, call 03-5623 2800 / 06-7982000.